No wonder police officer's are opting to leave here and work in Florida. Between the police department not having a contract and questions surrounding the hiring process, this lastest problem is the last thing the department needs. For the second time this year, some Danbury police officers have lashed out at the department's promotion process. At issue this time is the deputy chief's post — the No. 2 job in the department. Lt. Jeffrey Lagarto wants it. He's been told he can't have it because he lacks a bachelor's degree. But two other lieutenants without degrees are being allowed to contend for the post. "They not only changed the rules (to require a bachelor's degree), but they are not following their own rules," Lagarto said of the Civil Service Commission. The commission said the two other men have experience, education and training that is comparable to a degree. A fourth candidate does have two college degrees. 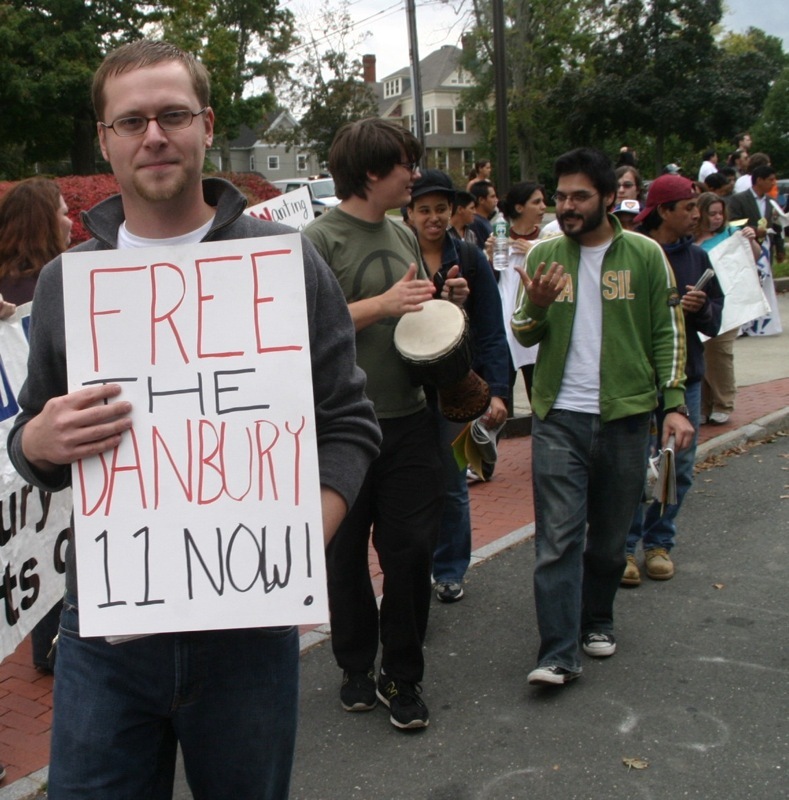 The Danbury Police Union filed a complaint with the city. To union leaders, the issue is not just Lagarto, a 17-year veteran. Their focus is on eligibility rules being changed midstream and increased distrust in the Civil Service Commission, which makes key personnel decisions for the city. Earlier this year, Lance Brevard, a black police officer seeking promotion to sergeant, complained the Civil Service Commission failed to place a minority member on a committee testing the candidates. The minority member was mandated by a settlement of a lawsuit brought by black officers in the mid-1990s. "It's obvious something is broken," Danbury Police Officer Mike Georgoulis, vice president of the union, said of the Civil Service Commission. "This has been a banner year for problems in promotions. I don't know if it's possible to get fairness back in this." As we noted in a earlier post, we here at Hat City Blog have been monitoring public access shows for the last year. We have a pretty good archive the political shows (I just love TiVo) and starting this week, we'll start commenting on two shows of interest which are In Our Opinion and Big-T Variety show. We'll supply video clips of these shows and introduce you to the wacky world of public access where anything goes and check and balance does not exist. While some of the episodes are somewhat informative, a good portion are clearly partisan, alarming, and rather shocking. Thanks to all who help out the Danbury Independent Media Center as they rasied enough funds to stay in their building on Main Street. These guys work their tails off to put out their free paper so please take a second and check out their website, download their newspaper and help support independent media. The guys at The Danbury Independent Media Center (IMC) are in dire need for cash right now as they are about to be evicted from their main street office. The IMC publishes the Hat City Free Press which has provided Danbury area with news and information for free for the last four years. The last thing you need during this election year is to lose your only source of independent, unfiltered media so please help them out and give what you can. Any amount of cash would be greatly appreciated so go to their website and help them out. A neighborhood forum on the Danbury Airport will be held on Aug. 16 at 7 p.m. in the Common Council chambers at Danbury City Hall, 155 Deer Hill Ave. If you have a gripe about the airport, here's the place to voice your opinion. I'm still waiting for someone to explain to me why the keycode for opening the gate was next to the keypad that opens the gate. I mean, why have a code if your posting the thing next to the lock. Maybe we'll videotape the meeting and post the video here for everyone to see. I'm in the process of doing an in-depth feature on the Connecticut Citizens for Immigration Control (CTCIC) but this letter to the editor from Danbury Chapter CTCIC President Elise Marciano proves my point about this hate group so well (and don't get confused, this IS a hate group) that I had to share it with everyone. I was very pleased to read the comments of the Rev. Laura Westby (letter, July 31). I was not aware that the First Amendment relegated free speech only to ministers or left-leaning people who want to suppress the voices of taxpayers and voters. Now we know what DACORIM stands for. You have to love how Marciano links Rev. Westby (minister for the First Congregation Church in Danbury), Danbury for Coalition Area the Rights of Immigrants (DACORIM), liberals, progressives, and anyone who doesn't believe in her lies with supression of speech (such a typical right-winged tactic). So now all of the sudden Rev. Westby wants to supress the lies that members of the CTCIC say writing in their letters. Well, the editorial board of the News-Times has the final say in what gets published and they should be more responsible in what gets in the paper becasue a good portions of letters from the CTCIC (including this one from their president) are full of lies and half truths and only inflames public opinion against immigrants in the area. The divisiveness she refers to was created by illegal aliens and immigrants who harbor, employ and encourage their people to come and break our laws on a daily basis. Read what she says carefully, she said "illegal aliens and immigrants" which means ILLEGAL and LEGAL immigrants. The CTCIC has never made a distinction between illegal alien and illegal immigrant so don't let the terminolgy. Can Marciano, or anyone from your wackpack, give us a list of local laws that are being broken by immigrants (it's funny how the Danbury police department couldn't provide us with anything so how did you get your imformation)? Don't let these jerks fool you, these people don't like ANY immigrants although they try to say they have no problem with legal immigrants in public. Her next paragraph provides more evidence to my point. Apparently, the First Congregational Church encourages people to break America's laws in the name of mercy. Where will it end? Doesn't she care that Danbury citizens are being disturbed by volleyball games that are run as a business, selling food and liquor illegally and parking cars all over the streets? I didn't know that all people who played volleyball were illegal immigrants. I didn't know that ALL volleybal games were selling food, alcohol and caused a traffic problem. Again, where did she or the CTCIC get their evidence to back up their claims? I guess her "mercy" is not for Americans. We Americans are offended by these people. Again Marciano never makes the seperation between illegal and legal immigrants because she and the CTCIC hates dislikes all immigrants becasue they don't share their "Danburian" values. They'll never come out in public and say this but we know of plenty of people who have attended these meetings and what they say in private is completely different from what they say in public. The "complex problems" she refers to have a simple solution - close our borders. This problem is not solved with mercy. We have always given refuge to political refugees. All the 15-20 million illegal aliens are not fleeing their country for this reason. They are here to make money, get on our welfare programs (called "anchor babies") and receive "free" medical care for the diseases they come with. They get all this "free" medical and living welfare courtesy of the American taxpayer. Again, I don't want to sound like a broken record but where is the evidence to back up your claims? If you're illegal, how can you receive welfare (you would think you'd need a social security number)? Do you think someone who is here illegally would risk being deported by trying to get federal assistance? How does Marcianoor the CTCIC know that illegal immigrants bring diseases from their native country? Can the CTCIC name some diseases that are native to Central America that is suddenly popping up in Danbury or anywhere in Connecticut? Where is the evidence to back up their claims? If this was a court case, the CTCIC claims would be considered hearsay at best. There is no evidence because these people dont care about the truth, just their cause which is to run all immigrants off of Main Street and out of Danbury in general. I suggest the Rev. Laura Westby take her ministry to Cuba or China or even North Korea where she will get her wish to publish articles only for the "common good," and where citizens are not encouraged to defend themselves from lawbreakers and divisiveness is not allowed. Will she and DACORIM and the ACLU defend the taxpayers who say "I'm not paying my taxes anymore." I am the proud president of the Greater Danbury Chapter of Connecticut Citizens for Immigration Control. Ah, you just couldn't finish your rant without throwing a spitball at the ACLU. Priceless. If this crazy letter came from the president of this organization, you can imagine what the average member is like. If you ever get a chance, I encourage you go to the Condordia Club in Danbury and sit in on one of these meetings and you'll see that the group are nothing more than a bunch of white "born and raised" people who are simply pissed off that their precious city is going through a radical change. They complain constantly about the changes on Main Street (before the creation of the Danbury Fair Mall, Main Street was the busiest part of the city where everyone shopped). They don't like the fact that the city they grew up in has changed to a multicultural magnet and they want to have their racist voce heard and the best way to do that is to latch onto the illegal immigration situation. A majority of the people in Danbury don't support these jerks and are embarrassed to have them in the city. If any political candidate links themself up with this group, they can kiss their political career goodbye (even Mayor Boughton has the sense not to get linked with these jerks). We'll post more on these a-holes in future posts. I just want to thank all the emails I've received since the start of this blog. It's great to know that this site is being read and most people agree with my viewpoint. For a site that's been only up and running for under a month, this is taking up as much time as my other site, CONNECTICUTBlog so it's taking some time to do the upgrades to the site that I want to do. Over the next couple of weeks, you'll see improvements to the site and I will provide plenty of video and audio links as well as interviews with many of the key political players in Hat City. If you have any tips, suggestions on stories, or gripes, email me at hatcityblog.yahoo.com. I'd love to hear form you! Peopleoften ask me on my views on the Connecticut Citizens for Immigration Control and their efforts to combat illegal immigration on Danbury. To best explain my views, one needs to understand what this organization is all about and who the key players are in the group. In the comming weeks, I'm going to expose to you what this organization is really about as we've been keeping a sharp eye on this group for some time and personally, the more you learn about them, the less you respect them or their misguided members. You'll understand what I mean later.